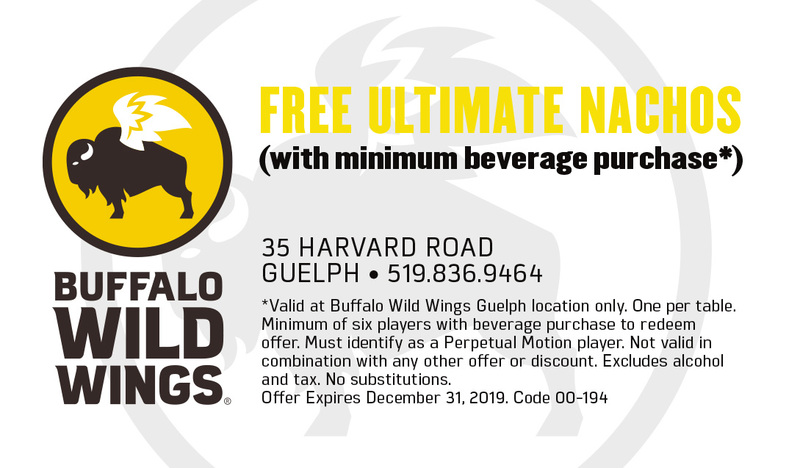 Sunday to Thursday - Perpetual Motion teams visiting Buffalo Wild Wings Guelph with 6 or more players are invited to enjoy one free ultimate nacho for the group with purchase. Available at Guelph location only. Extra charge for add-ons. Must identify as a player for Perpetual Motion player and show page offer to receive offer. Ask us about our Eat Wings, Help the Team program. It’s simple – dine with us, have fun and raise funds for your team. 10% of all food, non-alcoholic and alcohol beverage purchases goes back to your team at the end of the season. See store for details. Buffalo Wild Wings is the ultimate place to watch the game, have a cold drink and eat some great food. Buffalo Wild Wings: Wings. Beer. Sports.